What It’s About: Freight handlers Chick Young (Bud Abbott) and Wilbur Grey (Lou Costello) get in over their heads when the remains of Dracula (Bela Lugosi) and Frankenstein’s monster (Glenn Strange) reawaken and disappear almost as soon as they’ve arrived. Can they, with the help of sad sack wolf man Larry Talbot (Lon Chaney Jr.), stop Dracula from rejuvenating Frankenstein with Wilbur’s brain? Why Watch it Today? : Lou Costello died today in 1959. 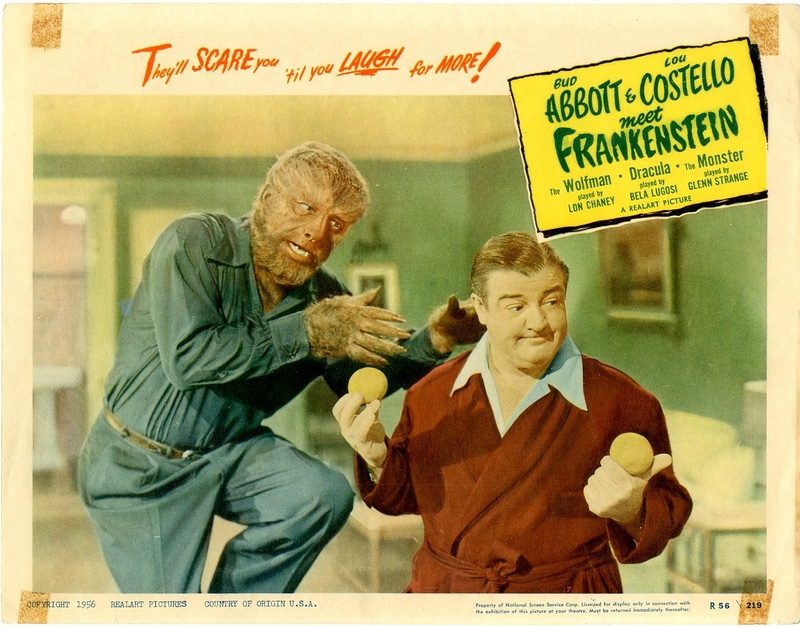 Abbott and Costello Meet Frankenstein was the first (and best) in the duo’s series of parodies of Universal monster movie properties, eventually meeting the Mummy, Dr. Jekyll and Mr. Hyde, the Invisible Man, and, well, Boris Karloff. The film’s success was due not only to the comedy team, but also to the fact that, by 1948, Universal’s monster series was already a parody of itself; the difference in tone between House of Dracula and this film is not as great as one might expect. Where to Get It: iTunes, Netflix or Vudu, or your local library. This entry was posted in Black and White, Buddy Flick, Comedy, Dracula, Horror, Lycanthropy/Jekyll and Hyde, Mad Scientist, Monster, Movie of the Day, Sequel, Slapstick, Spoof, Vampires, Werewolves and tagged Bela Lugosi, brain transplant, brains, Bud Abbott, children of famous people, delivery men, femme fatale, Frank Skinner, Glenn Strange, in over their heads, Invisible Man, it's not over, Larry Talbot, Lon Chaney Jr., Lou Costello, musical interlude, scientists, Universal International Pictures, Universal Pictures, Vincent Price.